REMINDER! You still have a week to enter my Kat, Incorrigible hot chocolate mug giveaway! Go to this post and follow the directions! You all know I love a challenge, so I thought I’d participate in the Reading Challenge 2015 from Popsugar. This isn’t a website I really go to all that often, but every now and then I come across a link that sounds interesting. #1 – Do a #project365. Basically, I’m trying to post a piece of my jewelry or something related to my jewelry making every day in 2015. I’m making it so far, so that’s good. That’s something quick and easy, although I do have to make more jewelry in order to keep up, so it’s got an added benefit. #2 – Be more disciplined with my creative pursuits. I need to spend more time writing, both here on the blog and my fiction. 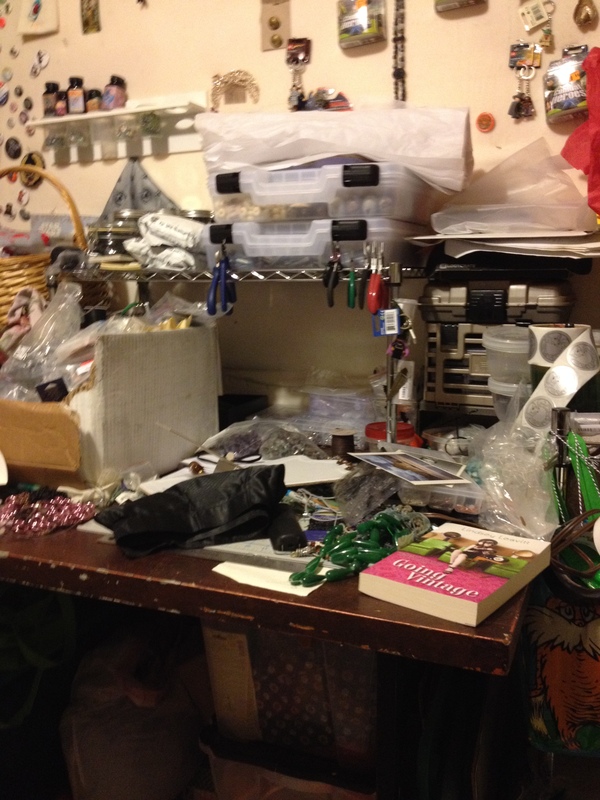 I also need to spend more time making jewelry and generally keeping my creative spaces clean. Right now both my desk and my work table are disasters. It’s hard to get a good workflow going when there’s clutter all around, but I seem to be addicted to clutter. I’m not really sure how to deal with that one. I also think participating in an external challenge could be fun. The Reading Challenge seems to be very do-able. I’ts almost more like a reading scavenger hunt. For my own satisfaction, I’m going to say that it’s one category per book, so I can’t, for example, say that I read The Interrupted Tale by Maryrose Wood and so I’ve read a book written by a woman and a book set in another country. If you decide to take the challenge you can do it any way you like! There are 50 items on the list, so that comes out to just under a book a week. I think it’s doable! Not a bad start. Let me know if you’d like to participate too! Lovely! I think I’ll have prizes for anyone who finishes with me.